Mix limeade and soda in a punch bowl. Add lime sherbet by the spoonful. Garnish with gummy worms, plastic spiders and eyeballs, or frozen strawberries (witch hearts) as desired. Serve immediately. For a spooky fog effect take two bowls, one large and one slightly smaller, and fill the larger one with hot water and dry ice. Place the smaller bowl in the larger bowl and fill with swamp juice. To make the punch slushy place your Sprite in the freezer until it gets slightly frozen before adding it in. My family has been making this Swamp Juice since I was little. It only has three ingredients that result in a refreshing lime flavor. The scoops of lime sherbet look like big swamp bubbles. I love it because it's simple enough that if you run out of it during your party you can just throw together another batch in a matter of minutes without meticulously measuring. Since it's so easy, you have more time to add a couple of extra touches that will make your Swamp Juice the main attraction of your party. Five cheap and easy ways to make your Swamp Juice spooky: 1) Gummy worms: Hang them over the edge of your punch bowl for a creepy crawly effect. 2) Floating spiders and ping pong eyeballs: These are both light and will float right on top of your punch to scare and stare down your guests. They can be found at your local party store. 3) Scary frozen hand: You can either make a frozen hand with plain water or the color of your choice. Fill a pitcher with 2 quarts of water. If you want a colored frozen hand add food coloring to desired intensity. You want to choose a color that will contrast the color of your punch so that it stands out. Just be aware that a contrasting color may change the color of your punch once it melts. Pour the water into a latex glove and freeze for a couple of hours. You might want to make a few frozen hands so that if you have to make another batch of punch you will have a new frozen hand to put in your new batch. 4) Witch hearts: Throw some frozen strawberries in your punch. Not only will they act as yummy ice cubes, you can tell your guests they are witch hearts. 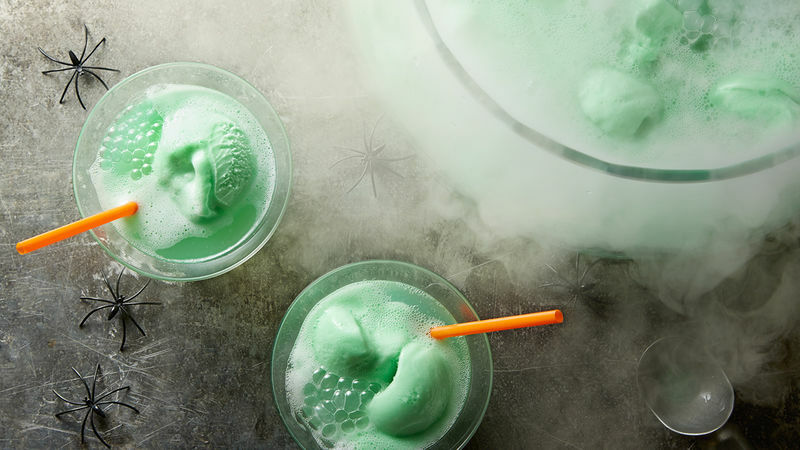 5) Spooky fog: Dry ice is a great way to add a mystical effect to any punch. Although growing up we always put it straight in our punch, technically you are supposed to have two bowls so that the dry ice doesn't burn your guest's mouths. Do as I say, not as I do! Fill the larger bowl with a couple of inches of hot water and some dry ice and watch the bubbles go! Place the slightly smaller bowl in the larger bowl and fill it with your punch. You obviously don't want to use all of the tips above at the same time or your punch may get a little crowded. Enjoy making your Swamp Juice!